I did not have the privilege of seeing this movie when it was released in theatres last summer. It was on my list of movies to see but things just didn't work out that way. So I watched it for the first time on Blu-Ray when screening it for this review. This movie was marketed incorrectly – it was shown in the trailers as being a summer popcorn flick with lots of special effects, chase scenes, action. In reality, this movie was an excellent coming-of-age story AND a fun ride to boot: fresh and enjoyable. Jay Baruchel (How to Train Your Dragon, Tropic Thunder) is the star as the young protagonist. He plays Dave, the unknown descendant of Merlin himself. Nicolas Cage is Balthazar Blake, one of Merlin's core apprentices, who has sworn himself to avenge Merlin's death by finding Merlin's descendant, no matter how long it takes. It took Balthazar over 1000 years to find Dave, who is incredulous when he is introduced to the world of magic right before his own eyes. Alfred Molina is superb as Balthazar's nemesis, with in a role that is more suited to him than his one in Prince of Persia. As the movie marches on, you get a feeling that you are watching a giant chess match, as both sides make moves and seem to get an upperhand before the next move is made, leaving you on the edge of your seat for the next move. The Blu-ray contains several special featurettes revolving around the making of several parts of the film, in addition to several deleted scenes – most of these special features are only available on the Blu-ray, and are worth watching. Do yourself a favor and seek out this movie on Blu-ray. 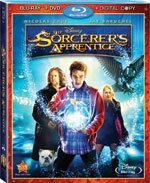 Download The Sorcerer's Apprentice from the iTunes Store in Digial HD. For more information about The Sorcerer's Apprentice visit the FlickDirect Movie Database.